Intellitec's Battery Control Center TM is a centralized power switching, fusing and distribution center designed for motorhomes. The including battery isolation, charging, and connectorized fuse block, was specifically designed to fit in tight spaces under the hood. The Battery Control Center TM system consists of two (2) Battery Disconnect Relays, a bidirectional battery charging circuit, an auxiliary start function to provide a "jump start" from the auxiliary battery, ignition power switching, and a fog light relay circuit. It is housed in a high impact plastic enclosure to protect the circuit components and keep them like new for years of operation. Installation is made easy by the incorporation of battery cable clamps eliminating the need to terminate the battery cables. The branch circuits are fed out through AMP Mate -N- Lok connectors. The unit is mounted to the vehicle with four mounting feet supplied with the unit. These feet can be attached to the unit in eight different locations to accommodate nearly any mounting configuration. The cover of the unit snaps off and on for easy service of the fuses should that ever be necessary. Each fuse is labeled in the box to make circuit identification a simple matter. Bi-Directional Battery Charging - provides charging of both batteries if either is being charged. The Auxiliary battery is charged from the engine alternator and the Main battery is charged from the converter when the coach is plugged into shore power. Auxiliary Start - provides a "jump start" from the auxiliary battery in the event that the main battery does not have sufficient charge to start the engine. 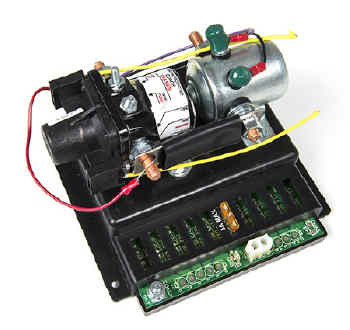 Ignition Switched Power - circuits are switched by three relays to supply power to the horn, the rear heater, the power windows and the power seat. Fog Light Relay - supplies 12 volts to the fog lights, when the coach is so equipped, allowing operation of the fog lights. Circuit Breakers - conveniently located near the front, at the bottom of the box. These circuit breakers protect the wiring between the Auxiliary battery and the converter. These breakers have manual reset buttons that pop out when they are tripped.